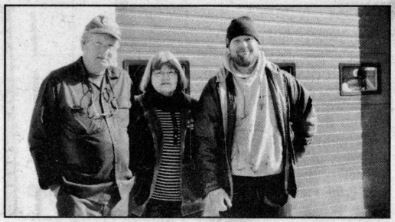 If you’ve ever gone into Sawe’s Automotive Service, chances are you were greeted by Darlene Sawe, and her husband Kevin and son Tim were behind the scenes fixing whatever was wrong with your vehicle. 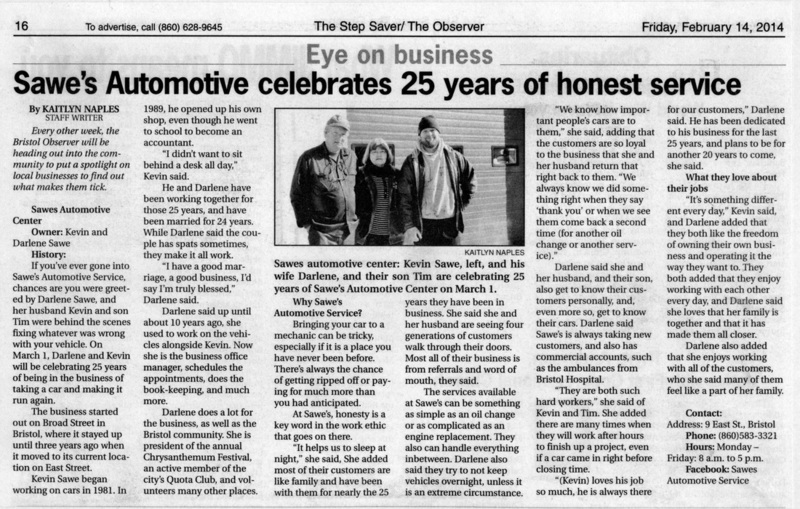 On March 1, Darlene and Kevin will be celebrating 25 years of being in the business of taking a car and making it run again. The business started out on Broad Street in Bristol, where it stayed up until three years ago when it moved to its current location on East Street. Kevin Sawe began working on cars in 1981. In 1989, he opened up his own shop, even though he went to school to become an accountant. “I didn’t want to sit behind a desk all day,” Kevin said. He and Darlene have been working together for those 25 years, and have been married for 24 years. While Darlene said the couple has spats sometimes, they make it all work. “I have a good marriage, a good business, I’d say I’m truly blessed,” Darlene said. Darlene does a lot for the business, as well as the Bristol community. She is president of the annual Chrysanthemum Festival, an active member of the city’s Quota Club, and volunteers many other places. Bringing your car to a mechanic can be tricky, especially if it is a place you have never been before. There’s always the chance of getting ripped off or paying for much more than you had anticipated. At Sawe’s, honesty is a key word in the work ethic that goes on there. “It helps us to sleep at night,” she said. She added that most of her customers are like family and have been with them for nearly the 25 years they have been in business. She said she and her husband are seeing four generations of customers walk through their doors. Most all of their business is from referrals and word of mouth, they said. The services available at Sawe’s can be something as simple as an oil change or as complicated as an engine replacement. They also can handle everything in between. Darlene also said they try to not keep vehicles overnight, unless it is an extreme circumstance. Darlene said she and her husband, and their son, also get to know their customers personally, and, even more so, get to know their cars. Darlene said Sawe’s is always taking new customers, and also has commercial accounts, such as the ambulances from Bristol Hospital. “They are both such hard workers,” she said of Kevin and Tim. She added there are many times when they will work after hours to finish up a project, even if a car came in right before closing time. “(Kevin) loves his job so much, he is always there for our customers,” Darlene said. He has been dedicated to his business for the last 25 years, and plans to be for another 20 years to come, she said. “It’s something different every day,” Kevin said, and Darlene added that they both like the freedom of owning their own business and operating it the way they want to. They both added that they enjoy working with each other every day, and Darlene said she loves that her family is together and that it has made them all closer. Darlene also added that she enjoys working with all of the customers, who she said many of them feel like a part of her family.